Skeleton King is a hero that have 2 lives. When he die, he have a skill to reincarnate. This sounds unfair for another heroes. But, this is the reality. 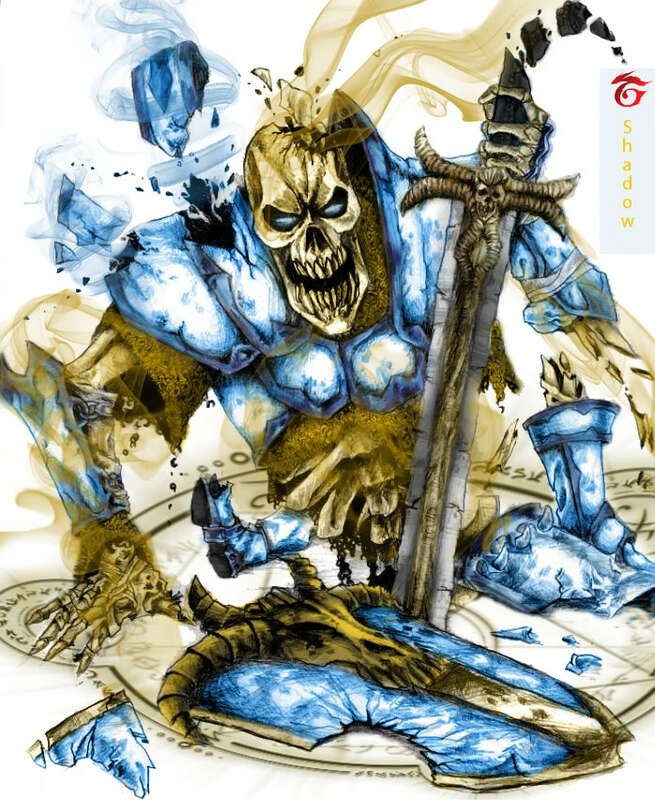 If you face Skeleton King, you must face his 2 lives. Actually you can kill him once if he has less than 140 mana or if his ultimate is still in cooldown. This hero also has high physical damage and lifesteal aura. And he also has a nice single targetted stun to chase enemies. This hero is also a tanker that tank any damage in a brutal teamfight. Ostarion calls on his hellish lineage, laying waste to his opponents. This skill is your main skill to stun the enemies. With this skill, you can gank enemy, you can disable 1 enemy in a teamfight, or you can chase enemy easily and attack him while he is being stunned by this skill. I believe you should max this skill first because it will be useful to stun a single enemy in ganking. Or you can defend yourself by using this skill to enemy whose chasing you. Help you and your teammates with a lifesteal ability for melee units. Creeps also get benefits from this skill. This skill will helps you in jungling on early game. With a lifesteal, and also with your 3rd skill, critical strike you can jungle pleasantly. Can helps allies in a teamfight for survivability if he keeps attacking. Will gives you a high chance of doing crtitical attack. This critical attack deal tons of physical damage that helps you in jungling, chasing, and killing enemies in teamfights. You are a true carry with this skill. 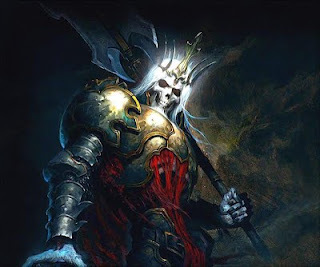 Skeleton King's bones reform after death, causing him to resurrect when killed in battle. Upon Reincarnation, enemy units in the area will be slowed by 30%. Makes you to have 2 lives. This is a wonderful skill. This is like your team plays with 6 heros because you have 2 lives. You can deal more damage because of this skill, you can tank more damage with this skill. This skill have a fundamental weakness. If you heve less than 140 mana, you can't reincarnate, so mana burn will makes you can't reincarnate, some heroes like Anti Mage or Ezalor that can burn mana will make you can't reincarnate. Diffusal blade is also harmful for you because diffusal blade will drain your mana and makes you can't reincarnate. You can also gives your first life to save your friend's lives. Or you can give it to initiate a teamfight. In situation when you have less than 280 mana, it's recommend for you to better die if Reincarnation is not in cooldown, because if you use the Hellfire blast, you cannot Reincarnate because lack of mana. Why maxed Hellfire Blast first? Hellfire Blast is your main skill for ganking and for teamfights. When in a teamfight, you should use this to disable 1 target and he can't do anything for 2 sedonds. Why maxed Critical Strike before Vampiric Aura? Critical strike is important skill for last hitting and harassing. Also makes you can knock down enemy easily while he is being stunned by your Hellfire Blast. You will deal about 2 times of your normal damage and makes your opponent on low HP. You have 2 options in mid game. If you are feel more comfortable with ganking, then get ready to find opponent together with your friends. Your main skill in ganking is Hellfire Blast. You should come from the jungle and immediately use Hellfire Blast to stun your enemy. And then you and your friends attack and use skill to him until he die. Just repeat this and you will be safe. If your friends is in danger, you can give up your first life and save your friend. Remeber you have 2 lives. Remember to keep your mana above 140, or if you feel the enemys is 1 Hellfire Blast away from die, you can use that mana for the Hellfire Blast. If you feel you need to farm for the glory of the late game, that's ok for you. You have the potential for being a good carry. Just farm fast and earn items fast. I recommend Hand of Midas for fast leveling and gold flow. I recommend you to kill ancient creeps constantly each minutes they respawn. With this strategy, you will be the main damage dealer for your team. Your weapon is your critical strike. You will deal lots of damage for your enemies. If you have aegis of the immortal, you will have 3 lives, and that's so hard for your opponent to kill you 3 times. And that's your chance to win the game. In late game I believe you should already have some nice items for your DPS output. You will deal lots of damages in teamfights as a carry. Be focused on a single target and change target if he dies, or he already far away to chase. You can Hellfire Blast him to makes him get stunned and easy to kill. Be brave with this hero. You are a durable DPS-er. I believe you can survive and keep killing each enemy in teamfight. Why Vanguard. Will reduce physical attacks damage. So good for a tanker like Skeleton King. Really helps in a teamfight against some physical attacks. Active: Unholy Strength - Gives +31 damage, +10 attack speed, and +25 strength while active, but drains 40 HP per second. You cannot die from the health loss when the bonus strength is gone, or the health drain per second. Why Armlet? It will gives you additional damage, attack speed, and tanking ability. Very good and also cheap for you. Makes you a decent carry with it's additional attack speed and lightning ability. +Armor aura and -Armor for enemies are very important for late game, so good for increasing team's defense and increasing team's attack. Carries should come after you initiate a teamfight and they should right click and use all their skills to the enemies. You have a single targetted stun which is required to know which one is your real target, and cloners can makes you use your stun into its illusion which is a harm for you. i gif you my shekel.